The announcement of Apple's new iOS 6 Maps at this summer's Worldwide Developer Convention took Google by surprise, because Apple still reportedly had a year remaining in its contract with Google to provide maps for iOS. 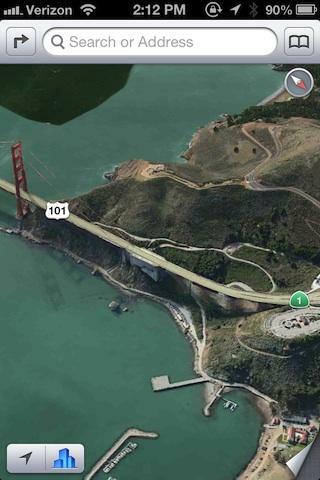 The surprise introduction of Apple's own Maps for iOS 6 gave Google very limited time to bring its own version of Maps to iOS. But Apple didn't just want to compete with Google. It wanted to show off an amazing Maps experience that raised the bar and would leave Google scrambling to port a good enough version of its own maps to compete with it. Google faced the task of not just porting its existing Android Maps version to iOS, but improving upon its features and appearance to match Apple's own version. That would logically include matching the 3D features of Flyover, which Google already has in a limited fashion on iOS in the form of its Google Earth app. Integrating Earth's 3D overview features into Maps Navigation would involve additional complication given that the two products draw from different code bases. 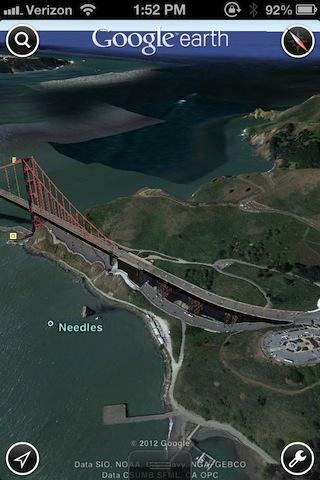 Google Earth also has the same kinds of 3D rendering glitches that Apple's Flyover has (the Golden Gate Bridge doesn't have a highway running beneath it as Earth's rendering suggests, below top, contrasted with Apple's Flyover view below it), making it impossible for Google to ridicule those kinds of errors without denigrating its own product at the same time. Earth is also less detailed, and its images are older than Apple's. 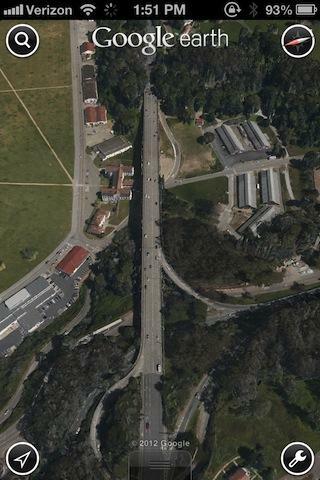 This Google Earth view of Doyle Drive in San Francisco (the Highway 101 approach to the Golden Gate Bridge) predates any construction, despite work having started in 2009. 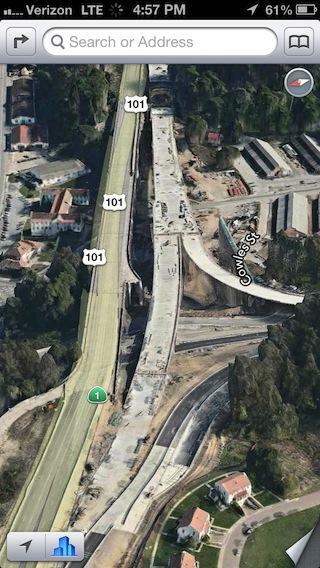 Apple's version shows advanced construction, although it too is several months old. 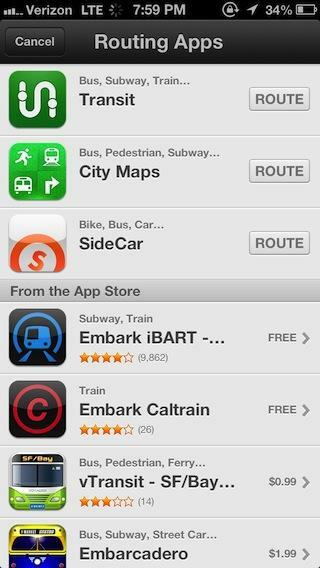 Additionally, all the work to produce a new Goggle Maps Navigation+Earth for iOS would need to be paid for by ads (just like Google's free Chrome browser or YouTube app for iOS), because few iOS users would be likely to pay anything substantial to replace Apple's own Maps with Google's version. In contrast, Apple's software development is funded through profitable hardware sales. If Apple had given Google advanced notice of its intent to take Maps solo, Google could have devoted its efforts toward introducing its own Maps alternative that matched Apple's features and added more of its own right at the launch of iOS 6. However, Apple's surprise announcement left Google with no recourse but to heap complaints upon Apple's new Maps while having nothing to offer as an alternative apart from its own limited web app. Meanwhile, iOS 6 immediately shifted users (and all third party apps) to Apple's own maps servers while Google was left vending its valuable information for free via in an inferior web-based interface. By the time Google can release its own Maps app for iOS 6, Apple will have had months to work out its place name bugs and visual 3D glitches from its own version. Additionally, millions of users will have grown accustomed to using Apple's revamped interface, its Siri integration, Yelp integration and its support for a range of novel third party routing apps to obtain everything from transit and water taxi routes to ride sharing services. How big of a deal is it for Apple to be getting (and Google to be losing) exclusive access to millions of iOS Maps users placing millions of queries and making millions of crowdsourced reports of traffic, place name corrections and other direct and/or automated feedback? Consider that in early 2010, when Skyhook Wireless inked a deal with Motorola another Android licensees to use its own WiFi-based geolocation features in place of Google's Location Services, Android product manager Steve Lee stated, in emails revealed through subsequent court proceedings reported by the New York Times, that the deal "would be awful for Google because it will cut off our ability to continue collecting data to maintain and improve our location database." Google subsequently informed its licenses that using Skyhook for their WiFi geolocation would invalidate their promise to uphold "Android compatibility," an opinion Motorola initially described as "unfounded." One month later however, Motorola informed Skyhook that their agreement had been terminated because of Google's determination that it "renders the device no longer Android Compatible." Skyhook subsequently sued over Google's strong-arming to stop its geolocation service deal with Motorola, and additionally accused Google of stealing its technology. The real issue, Google's lawyers stated in response, was not Android compatibility but rather that Skyhook had infringed upon Google's "contractual rights to collect end-user data." If Google felt threatened by a startup making deals with Samsung and Motorola on select Android smartphones, imagine how the company feels about instantly losing access to collect map queries and traffic data across tens of millions of Apple's iOS users.